Hog And Shop: Did You Know There's An Adorable Gift Store Inside Candies? 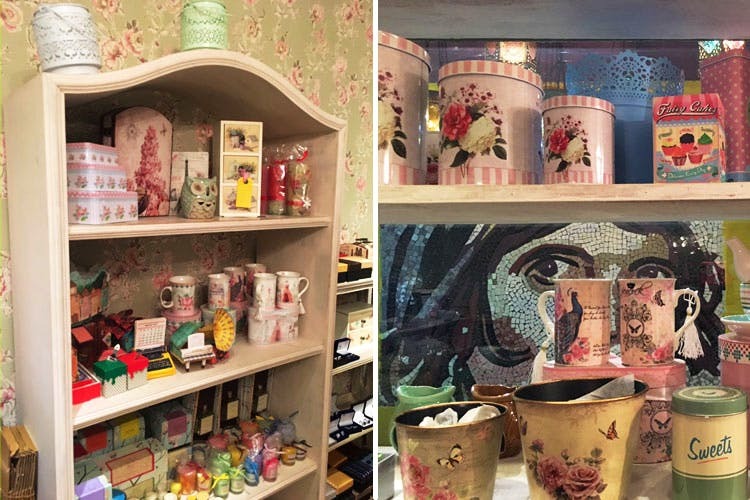 A charming vintage store rests inside Candies in Bandra – brimming with dainty trinket boxes, leafy notebooks and biscuit jars. How often have you been to Candies Bandra and walked by without noticing this store? We don’t blame you, it must be all the sugar rush. But it’s time you notice ‘Marry Me’ – the store owned and run by Candice Pereira (also the muse behind the name Candies). In this floral-wallpapered store, Italian music streams through the speakers while you are left to your own devices to explore. Home décor items, knick-knacks for your room, accessories and other bits and bobs are present here. From brown paper notebooks to nautical themed framework to hang on your wall, from coffee tins with a vintage print to needlework boxes, from pastel watering cans to transitter shaped clocks, this store keeps a gamut of products. These are priced with small tin boxes for INR 80 to notebooks for INR 300. The place seems like it belongs on a street in Europe, not inside a restaurant – and is the perfect place to get a pretty something for yourself on a low day without spending too much – or for the benevolent, a gift for others. Marry me, it asks? Well, if you don’t mind, that’ll be a yes.